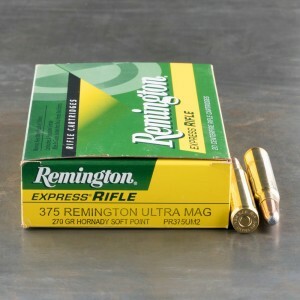 375 RUM ammo isn’t the best known cartridge out there but it’s an up-and-coming round for big game. 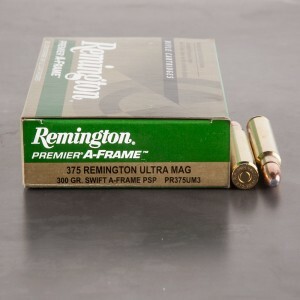 "RUM" is the acronym for "Remington Ultra Magnum." Remington introduced several "magnum" versions of popular cartridges producing some pretty impressive performers. Remington's RUM stable includes the 7mm RUM, the 300 RUM, and the 375 RUM. The .375 RUM is an incredibly efficient caliber that bests the renowned .375 H&H performance wise. It's considered one of the faster .375's out there. The cartridge begins as a .404 Jeffery and is then necked down; the result is the .375 RUM that houses an insane amount of powder enabling the it to launch a 270-grain bullet up to 2,900 fps while the 300-grain comes out hot at up to 2,760 feet per second. Delivering over 5000 foot-pounds of energy, not much can stand in its way! Of course it launches in both directions; the shooter will feel significant recoil!